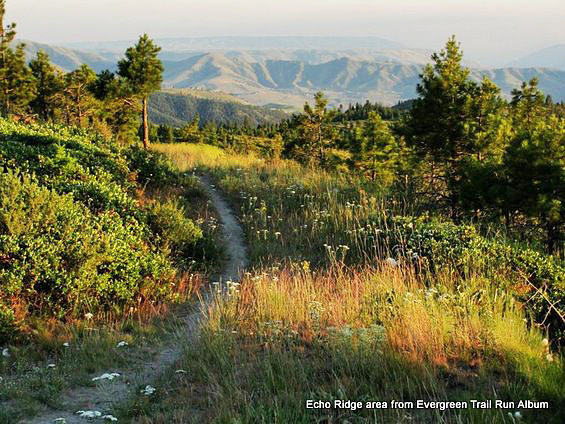 Designed originally as a Nordic Ski area, Echo Ridge has turned into a summer trail hub for mountain biking, trail running, and family outings. The trails contour hillsides, follow ridgelines, and dip through broad drainages with expansive views over Lake Chelan to the south, forested foothills to the north, and the high Cascades to the west. The trails are typically accessible from mid-April to mid-November and each season provides a unique setting. In late spring and early summer the flowers are still plentiful even though the bloom has faded down in the towns flanking the Columbia and Wenatchee rivers. You can easily beat most of the summer heat by heading to Echo in the morning and late evening hours when the days are long. Also in the early fall the temperatures cool and the fall colors show their vastness across the landscape. Summer Trail CONSTRUCTION UPDATE: Check out this video of the new trails at Echo Ridge. Construction of 11 new miles of trail for hiking and biking is well under way with 7.5 miles of new trail constructed since 2014. 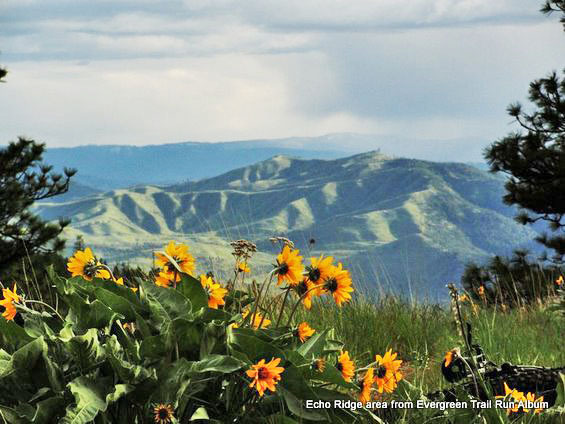 The idea is to create new trails that link with the best that Echo Ridge has to offer. So, the hiking, trail running, and mountain biking are getting better each summer. Check back for updates or call the Chelan Ranger District at 509-682-4960. Map of Trails: Echo Ridge Bike and Hiking Map. Activity: Hiking, Mountain Biking, Trail Running, Family Fun. Nearest Town: Chelan, Manson, Entiat. Skill Level: 1 (accommodates all skill levels). Fitness Level: 1 (accommodates all fitness levels). Distance: 25-plus miles of roads and trails that are part of the Winter time Nordic skiing system. 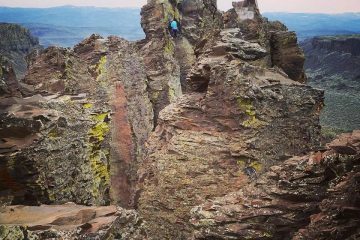 Hikes, rides, runs between 1 and 25 miles in length are all possible up here. Elevation: The trails/roads lie between 3000′ and 4300′ of elevation. Access: The trails are about 9.5 miles from the town of Chelan. Follow the Manson Highway (SR-150) 2 miles to Boyd Road and turn right. Follow Boyd Road to Cooper Gulch Road, following signs to the end of the pavement at the Echo Valley Ski Area. From this point, a Forest Service road winds steeply uphill for about two miles where you’ll reach the main parking areas – Lower and Upper Echo Trailheads, both capable of holding about 50 vehicles. Other trailheads include the Switchback Alley, The Shoe, and North Junction, or the parking area at the bottom of the Bergman Gulch Trail. Recommended Hikes: Print out the Echo Ridge Bike and Hiking Map and pick an option that looks good – novice, beginner, or intermediate. There are even three recommended hikes mapped out for trail users. Some notable trails for hiking include No-Where to Hide, Outback, Little Critter and Ridgeview. For quick access to the Outback Loop park at the North Junction Trailhead and on your way around the loop include a trip to the high point at 4324’ know as Russell’s Butte via Mallory’s Trail. Recommended Mountain Bike Rides: Just pick trails highlighted on the best mountain bikes rides map. 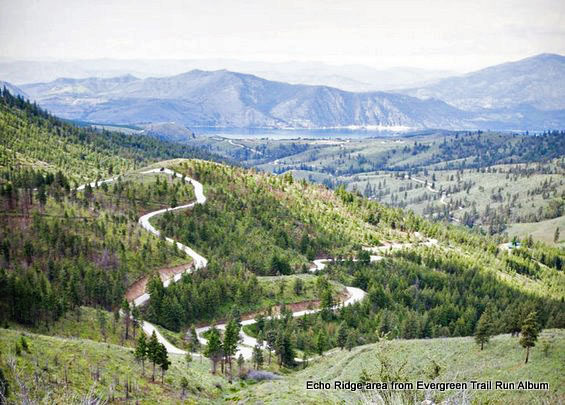 For the best loops with longer climbs and descents start your ride at the courtesy parking lot just Past the Chelan Rentals Resort cabins at the bottom of the Bergman Gulch Trail. Shuttling is easy and also gaining in popularity via the Lower Echo Trailhead and North Junction Trailhead that access the best descents in the trail system. The longest (5.5 miles) descent at Echo is down Mallory’s Trail, the Outback Trail and Waterbar Heaven. Trail System: The terrain is gently rolling and the smooth trails wind through the head of several broad drainages, giving a sense of solitude and wilderness on even the busiest days. Hikers and mountain bikers who want to start on top should begin their trip from the Upper Echo Trailhead and head north. Those wanting a bit more ‘vertical’ should start at the parking area at the bottom of Bergman Gulch. The system is divided in several different loops coming together at 5 major junctions. The routes are well signed and, if you carry the map(s) with you, you can explore the area as a novice without worries of getting lost. Uses Allowed: In summer dogs can accompany you on the entire trail system. In winter pets are only allowed on the on a few ski trail and all the snowshoe trails. 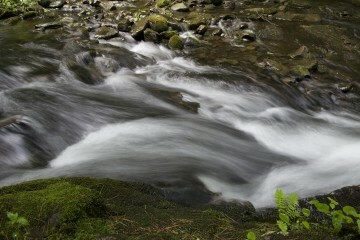 Management: The Echo Ridge Nordic Area was established in 1991 by the US Forest Service. Summer operations are managed by the Chelan Ranger District with trial maintenance support from Central Evergreen Mountain Bike Alliance. Fees/Permits: Currently, none in the summer months. In the winter the trail fee (paid at self-serve drop boxes in the parking areas) is $10 per day per adult. 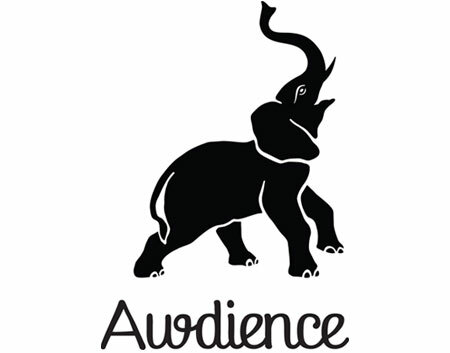 This article was originally written by Allison and Andy Dappen in 2008. It was updated on 12/29/16 by Paul Willard and Sarah Shaffer. Additional Information: Chelan Ranger Station, 509-682-4900. If you didn’t catch the video at the beginning of the article here it is again. Awesome mountain biking to be had!